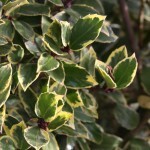 A slow growing pyramidal shrub with shiny green leaves that are variegated with creamy yellow and gold. When planted near a pollinizer, it will have red berries in the late fall. 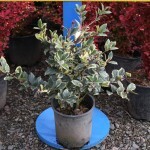 It needs full to part sun and prefers well-drained, slightly acidic soil. Prune as needed for form. Useful for foundation plantings, hedges, or mass plantings. PP 12,060.